The End of Mankind is near! 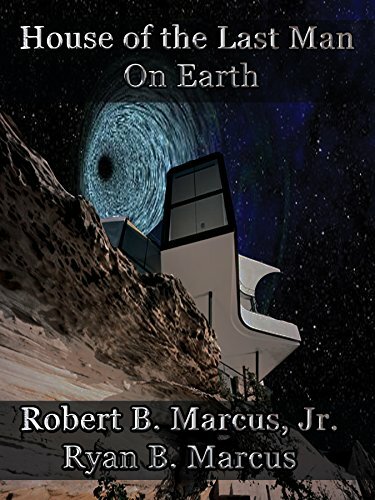 Convinced that his bizarre neighbor might be a part of a hostile alien agenda, college student Richard Johnson, along with his mathematics teacher and her brother, embark upon a soaring and treacherous journey through light-years of space and thousands of years of time to discover a terrible truth — mankind is being slowly and systematically exterminated. It has been a long time since I have dipped my toe into the pool of science fiction so I was excited to get started. I had just signed up for NetGalley and basically requested to read one of the first books that I found in the science fiction category. I was immediately given access. Uh oh...did I just choose a loser book that I was now required to review so that I could read better books?!? I began a search for reviews of Robert Marcus' books to see what I had gotten myself into. What I discovered is that he has written several books, a few of which had zero reviews or ratings, with the remainder of the books having very few. The book with the largest number of ratings and reviews was The Far Side of Silence which was reviewed or rated by less than 40 people. Those people seemed to like it though as it had a 4.29 average on Goodreads and 4.5 on Amazon. Why aren't his books being read? Do people think that an oncologist can't write good fiction? WAKE UP PEOPLE! This book is worth reading. No piece of junk here lurking for unknowing bibliophiles. This was a book that rapidly gained my attention and kept it. I found it to be a quick read, as in I finished it in a day because I didn't want to stop reading it. It had some great action and some twists and turns. Best of all, it lives in a unique space and time that is not crowded by everyone else's already done to death ideas. The characters were engaging. My absolute favorite was Genghis Kahn, described as "a fat, ugly registered purebred bulldog who was over seventeen years old." Why was a dog my favorite? Probably because he is brave and completely stubborn. Read the book and I bet he will be your fav too. FYI - I love science fiction but am completely and totally clueless about the science part. So I must leave it to you to determine whether any of it is accurate or not. I did mention that the author is an oncologist right? I bet he knows a bit about science. While I did recognize one or two of the terms floating around (I got DNA!) there is no doubt that the science involved is WAY over my head, so it should definitely mean something to those of you that love the science over the fiction part. I love that I don't understand all of the science. It just shows how much smarter the characters are than me so they have to be heroes, and they are. My only semi-spoiler...they save the world folks! Now just a friendly warning. Begin this book after a restful sleep and a full stomach. You will be reminded, maybe more than necessary, that the protagonist doesn't get much of either. To recap, this is a book that is definitely worth reading. I'm signing off now in order to seek out another of his books and curl up for a good read. As a reviewer for NetGalley I received a review copy of this book in exchange for my honest and unbiased review. My thanks to NetGalley, the author, and publisher. Robert B. Marcus Jr. is a practicing radiation oncology physician. He has been a Professor at two major medical schools, and has been listed in U.S. News and World Reports Best Doctors in America, as well as Castle Connolly's Top Cancer Doctors and Castle Connolly's Top Doctors in America. He has been president of FLASCO, the society of all the oncologists in Florida, and has authored or co-authored almost 200 medical journal articles and chapters. He has been selling fiction since he was in college. Since then he has published a number of short stories and three novels, with one forthcoming novel, a political thriller novel (Yesterday's Tears), the sequel to the published thriller The Far Side of Silence. He is a lifetime active member of Science Fiction Writers of America and an active member of the International Thriller Writers, Inc.